not seeing any reason why they wouldn't, but will these accommodate buchla panels as well? 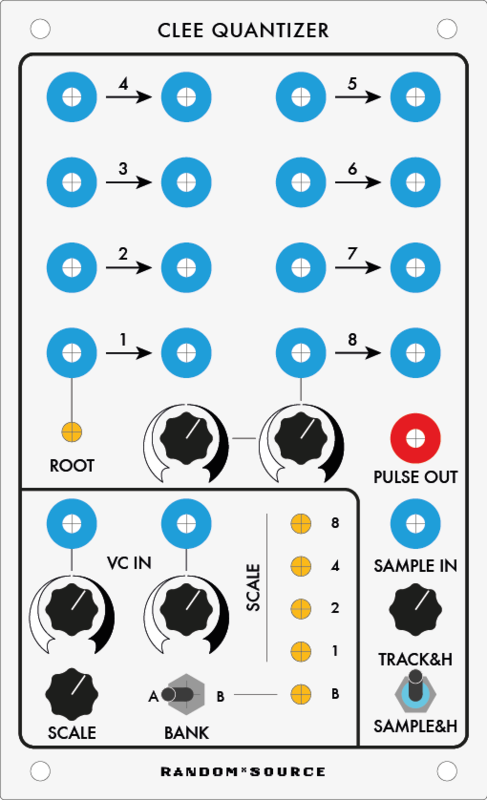 these 4x4 panels could work really well alongside buchla (most likely would have to be separate boats for 15V/12V,etc. but whatever). Re TKB, it looks like zthee's upcoming TKB kit has different mounting hole positions compared to existing (STS) TKBs, which makes things more complicated. We'll probably ignore the TKB for the first round, but could think about a special (shallow - 2" ?) TKB boat for zthee's run if there is enough interest. Anyway, we intend to place the order for the first round of boats and rack ears in a few days. So if you want to be in, please post in this thread. 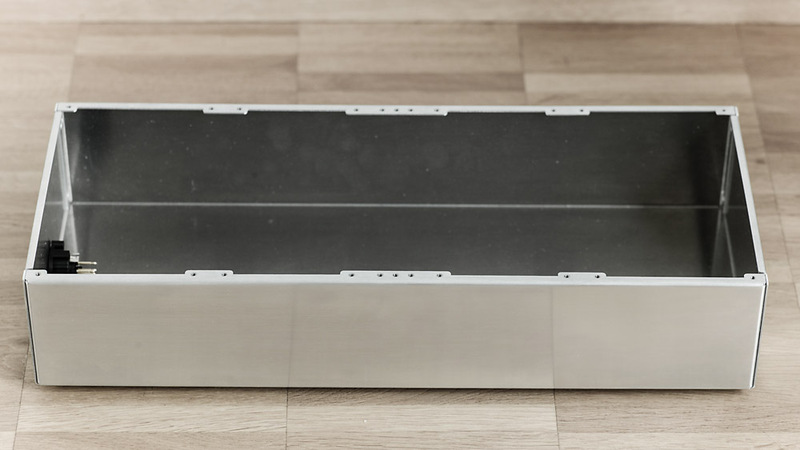 "Boat is designed to mount 4 modules (each 4.25" wide)"
Are the holes the right distance from the corners? Crossing my fingers. Our design is clearly aimed towards (existing or future) Serge users and 4U banana converts, so compatibility with existing (STS) panels is high priority. The 4x4 concept seems like a good way to add flexibility but still keep look and feel (and cost down). Buchla is a different story IMO - different measurements, different voltages, power distribution requirements, so I think it makes more sense to leave this to projects dedicated to Buchla. Since mixing Serge + Buchla panels doesn't seem to make much sense, I don't see the benefit of having a boat to fit both. Also, the we are using a very sophisticated technique in production - threads are made by the same machine that also does the laser cutting - right into the existing material (no more nuts pressed in). These threads already drive up the cost, so adding another 16 for Buchla would make it more expensive and probably not be possible due to overlapping holes. I keep hearing the Q-word - is this what you have in mind? Looking at it laid out I can now see that the LCD option wouldn't fit unless you stretched it into more panel space horizontally. I'll be after a couple of these from you - thank you for taking the time to mock it up!! Put me down for one boat going to uk. So when do you order the boats ? Too late for changes obviously, but why not have the tab for the "rails" go all the way across with screws at 1" increments? Then you can mix 4x4 panels, single panels, STS M-Class, etc, and everything would be more modular. The 4x4 is a cool idea and more flexible than the shop panels but not as flexible as single columns. Having single-function modules bundled with others behind a single panel inevitably leads to redundancy in a system. The added manufacturing cost would be minimal. Respect for the hard work of course, the results are looking great and I'm sure this took an inordinate amount of time and effort. 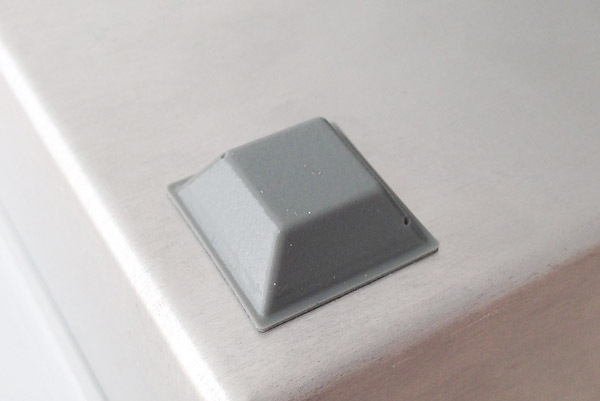 Having the tab go straight across the boat would make mounting of STS modules hard or impossible - the gaps in between allow for some maneuvering space to account for the power cord or the cable binders holding the pcbs. Also, there's no simple grid that would allow all possibilities - 1" spacing would not be compatible with full panels like Edelweiss or any STS modules/panels. Also, we're using a very fancy machine that does both the laser cutting and threads (right into the material, no pressed in nuts), so (roughly) doubling the number of threads would drive up the cost. For the same reason, we never aimed to be compatible with Buchla. OK, thanks for all the info, and sorry to make assumptions. Getting things like this made is definitely not easy. Unlike the prototypes, the boats now have very nice (flat and closed) rivets. Shipping will start next week - I'll post details (payment etc.) in the next few days. 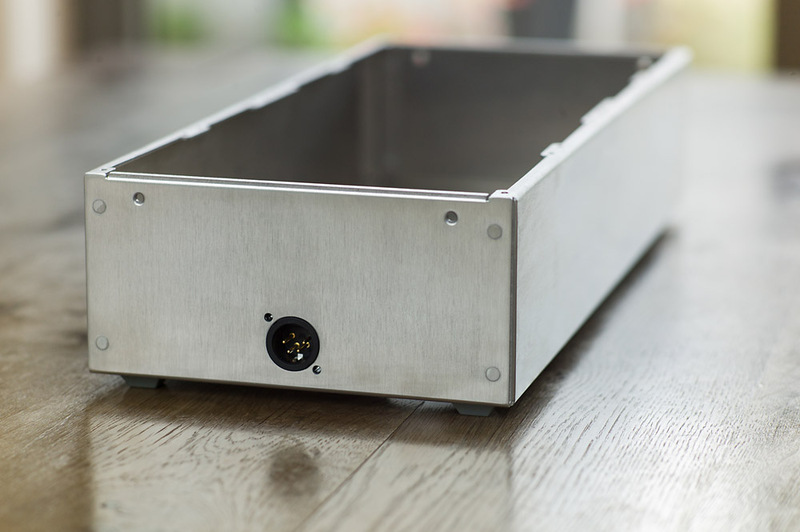 How are you going to plug the power connector in when it is mounted in a 19" case with sides? Don't use a 3 pin XLR for power (it is a far too commonly used audio connector), 4 pin XLR if you must, but not for >250mA. XLRs are limited by their contact resistance and the wire size that can go through the cable entry--even with an extra large Neutrik boot. I recommend Trident connectors now as they have much lower contact resistance and can take larger cable sizes. The normal Serge 4 pin power connectors may be panel mounted, the tabs that stick out the sides bend back and then they just clip into a rectangular hole. These would be electrically better and cheaper than XLRs inside a rack case. Power cabling to an external PSU can end up getting very expensive and it effects the power rails regulation and performance of the modules. The short side is really the only good place for the connector. It can't go on the long side for obvious reasons, and if it was on the bottom then folks couldn't use them on table tops. Neutrik makes a nice right angle XLR plug, though I don't recall what direction the plug long side goes in relation to the pins. There should be enough room behind the rack rails for a right angle plug.